Detailed information from the NTSB investigation into the October 21, 2009 incident involving the distracted Northwest Airlines pilots have been released to the public. The incident, which resulted in a large amount of media attention, occurred when the pilots of Northwest Airlines flight 188 was out of contact with air traffic control for about for 77 minutes while cruising from San Diego to Minneapolis. 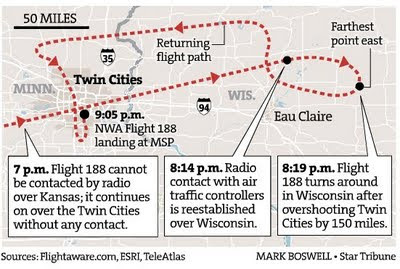 The Airbus A320 (N03274) overflew Minneapolis by more than 100 miles before re-establishing radio contact with air traffic controllers and landing at the destination airport. There were no injuries to the 149 aircraft occupants, or damage to the aircraft. Reportedly, one of the reasons why the pilots did not respond to radio calls was because they were using their laptop computers in the cockpit and were distracted. While using laptops in the cockpit is allowed by the FAA, use of personal computers in the cockpit was not allowed by Delta (which owns Northwest). Both pilots were dismissed by the airline, and the FAA revoked their licenses. Included in the docket will be factual reports from several of the NTSB-led groups involved in the investigation, including the Operations Group, Air Traffic Control Group, Survival Factors Group, Cockpit Voice Recorder Group and Flight Data Recorder Group. The docket will be available on Wednesday morning, December 16th. To view the contents of the docket, visit the the public docket page for this incident. Even though Delta owns NW, the NW flight manual does not prohibit NW pilots from using personal computers. The Delta manual does, but does not become effective for NW pilots until we become one airline late December. So, the pilots were not in violation of any existing FAA or NW airline rules. The two pilots have not been dismissed by the airline and are on administrative leave, pending their investigation. The only reason they cannot fly is that the FAA revoked their licenses. Both Delta and NW have an active ASAP program, which was circumvented by the FAA when they prematurely revoked the pilot's licenses.